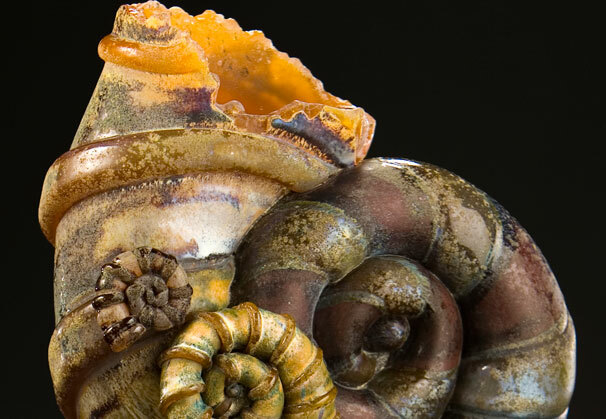 Kelly O’Dell’s work searches the past (as in millions of years ago) for inspiration. 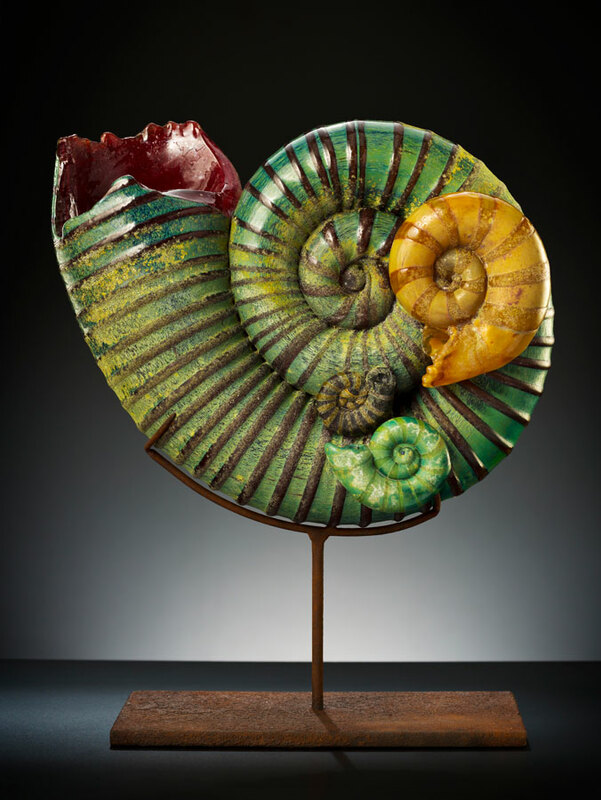 Her sculptures of dinosaurs and ammonites explore themes of extinction, preservation, discovery, and self-reflection. She finds beauty in texture and in embracing the technical challenges that horns, claws, teeth, and wrinkles in skin present in her pieces. 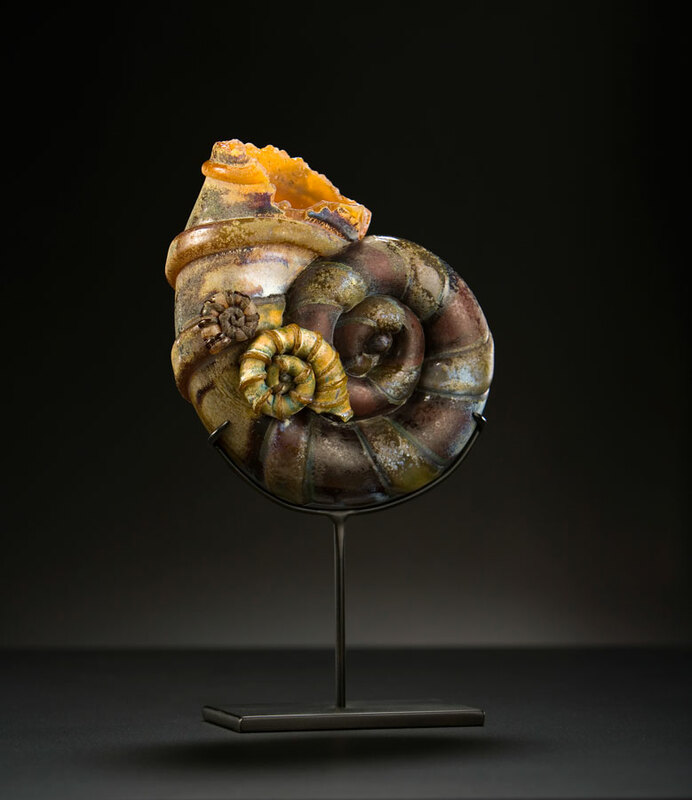 Kelly O’Dell is represented by Kittrell/Riffkind Art Glass, Dallas, Texas. 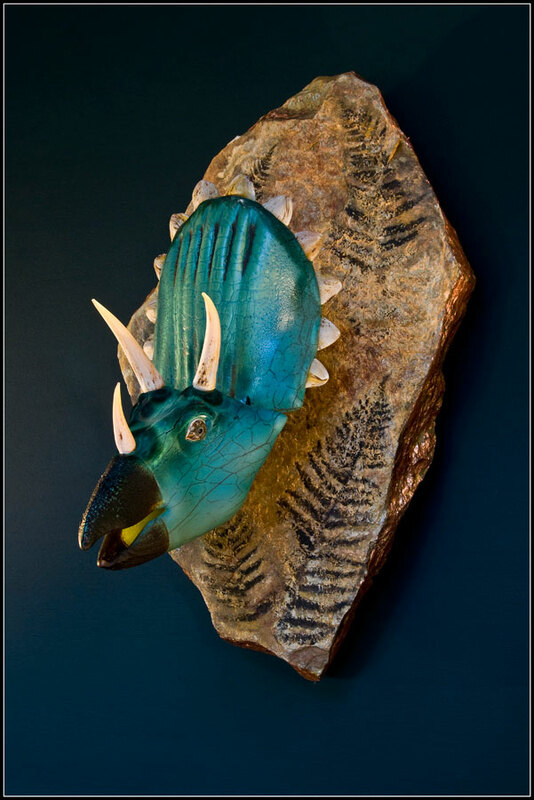 65 million years ago, mass extinction occurred. It is believed an 8-mile wide comet hit the earth near the Yucatan peninsula, affecting our planet’s weather in ways to make life scarce. 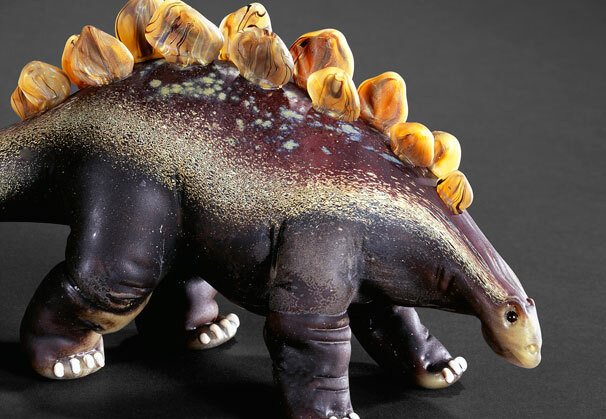 Some of the last dinosaurs that roamed the earth at this time were the Triceratops, a three-horned bird-beaked creature, and the Tyrannosaurus, said to be a deadly enemy of the Triceratops. These huge dinosaurs, and those which passed on millions of years before them, left their bones behind to give us clues to the past. 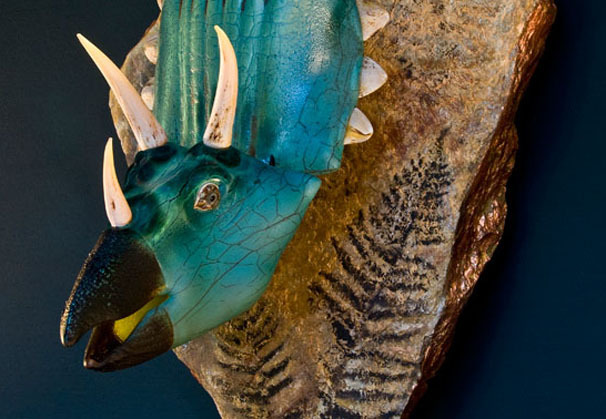 65 million years later, I am replicating the ancient beasts in glass. In 2003 I took the incredible opportunity to join the William Morris team. Daily interaction with skillful artists at work inspired me to try some of the tricks I observed. Flipping through an illustrated book of reptiles from the past, I discovered a multitude of features I wanted to try my hand at. 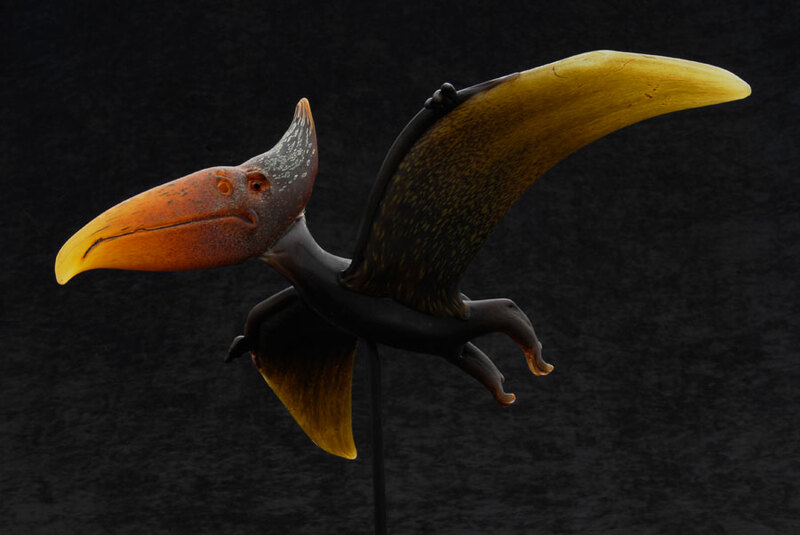 I consequently chose a subject to face the challenge of sculpting glass: the dinosaur. 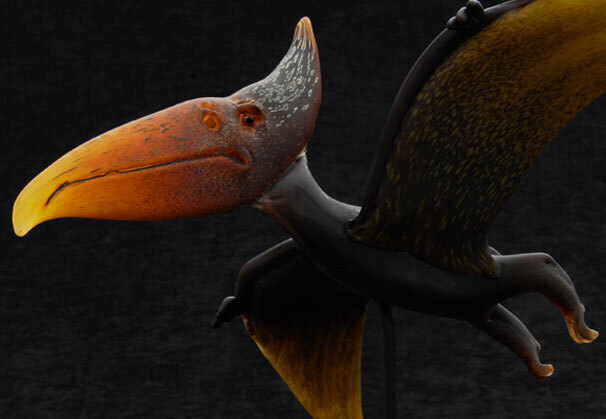 What color and texture to explore, what opportunity for crafting detail in beaks wings, eyes, horns, claws, teeth, toes, and wrinkles of skin, what fun for a technical challenge! Soon the dinosaur meant much more to me than a learning tool. 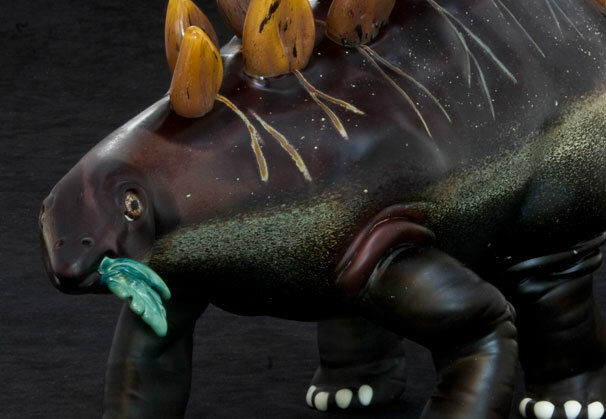 By creating these animals using glass as a medium, I am unearthing themes of extinction, preservation, discovery, memory, and self-reflection. By studying bone structures and fossils I often arrive at thoughts of my own mortality. Our existence here as a human race seems timeless; it is difficult for us to comprehend life on earth before or after us. I think collective mindfulness of our borrowed time here could contribute to a happier, healthier planet. As a human race, we might appreciate our time here better if we could take a step back and take a look at the bigger picture. 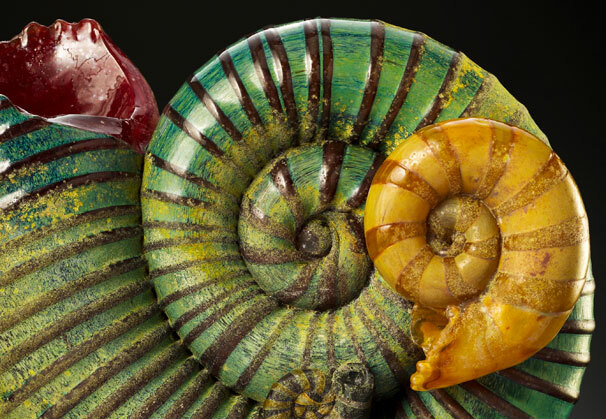 The ammonites, for me, are clues of the past, objects of curiosity which are left for us to respect, study, ponder, and appreciate. 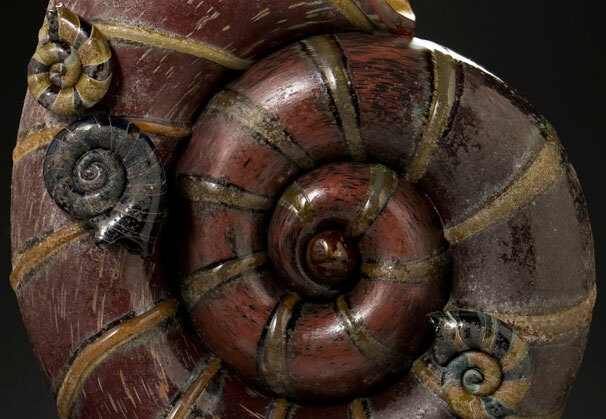 Their beautiful shells were homes to animals no longer alive, but could be re-inhabited today by another creature, and used as functional shelter. 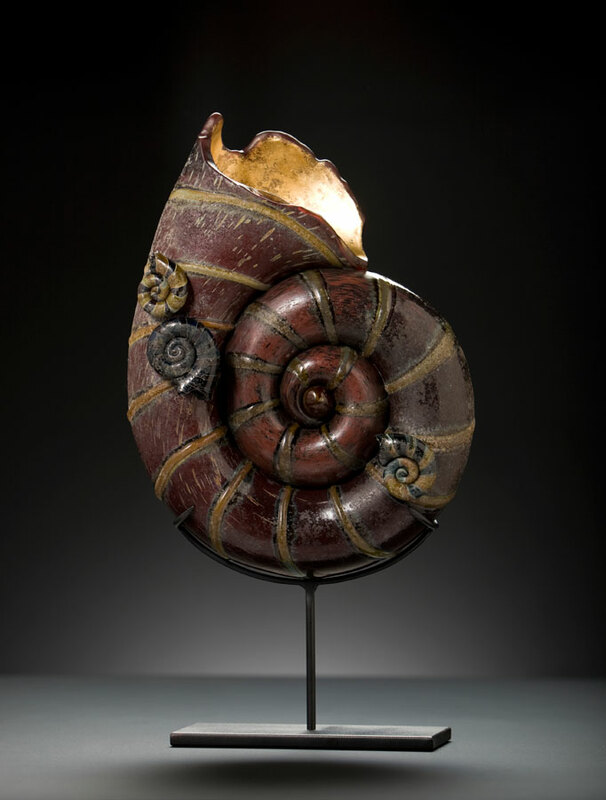 These fossil forms represent a more responsible way of thought in just recent times: to “reduce re-use and re-cycle.” My next series will include plants and animals inhabiting the ammonites to convey this message. A Latin phrase meaning “remember that you are mortal,” memento mori, labels a timeless genre of art and philosophy. For some it signifies a reminder of religious obedience, or a tribute to history. For others it suggests the certainty of death, taking pity on no one. For me, memento mori is a didactic reminder to work your hardest, follow your heart, and do the best you can at everything you do. Captivated long ago by her father’s glassblowing, Kelly O’Dell was involved with glass at a young age. 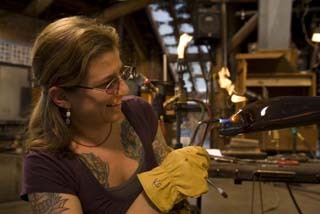 Kelly’s family lived in Kealakekua, Hawai’i, where her father built himself a glass studio at their home. It was 1979, at 6 years old, when she remembers her father dribbling hot glass on the concrete floor, spelling words and names for the crowd surrounding him. Twenty years later she graduated from the University of Hawai’i at Manoa in Honolulu with a BFA degree in studio art, with a focus in glass. With Rick Mills as her instructor, Kelly’s experience at the university provided her the tools and knowledge to leave the islands for a much bigger world. Eager to immerse herself in the glass movement, Kelly moved to Seattle where she assisted various artists in their studios. Here she worked and studied at Pilchuck Glass School and Pratt Fine Arts Center, and began to exhibit her work actively. She took the opportunity to work at Caleb Siemon’s glassblowing production studio for two years in Orange County, California, where she developed an appreciation for color and design. In 2003, the William Morris team welcomed Kelly aboard. 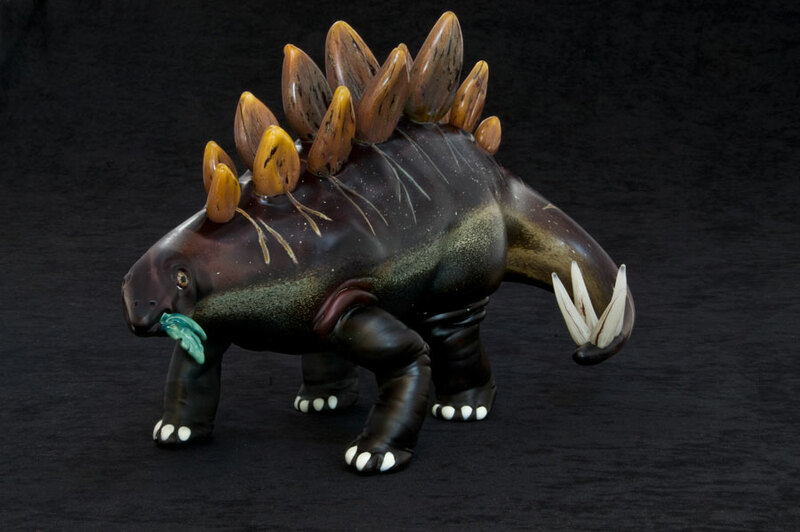 She enjoyed assisting Morris during his last few years of glassmaking, and continues to work at Pilchuck Glass School during the winter season. Aside from making her own artwork, Kelly also fabricates the metal stands for her work. Kelly has exhibited her work in the Young Glass 2007 Exhibition at the Ebeltoft Museum in Denmark. 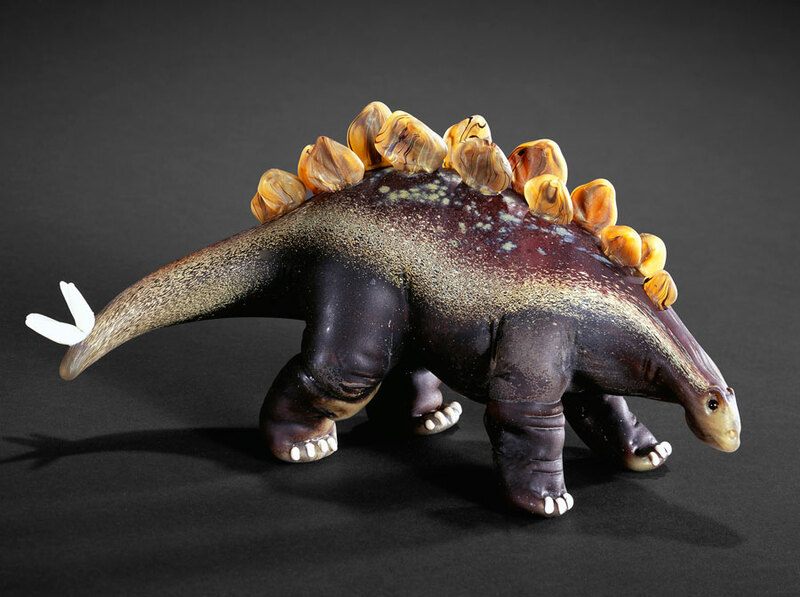 She also had her first solo exhibition, “65 Million Years,” at Vetri Gallery Seattle in 2008. In 2009, Kelly participated in the SOFA Santa Fe Exhibition, represented by Evoke Contemporary Gallery. She also recently attended the 22nd Annual Niijima Glass Festival in Japan as a teaching assistant for Randy Walker. She currently lives in Stanwood, Washington with her partner Raven Skyriver and their 2 year-old son Wren. We are grateful to Kittrell/Riffkind Art Glass, Dallas, Texas, for providing the materials for the Artist of the Month.